The calculation of Cuban GDP is, surprisingly, a contentious issue. There are those who say that Cuba is one of the richest countries of Latin America, and there are those who say that the Cuban economy is mediocre. Who is right, and what causes this divergence? 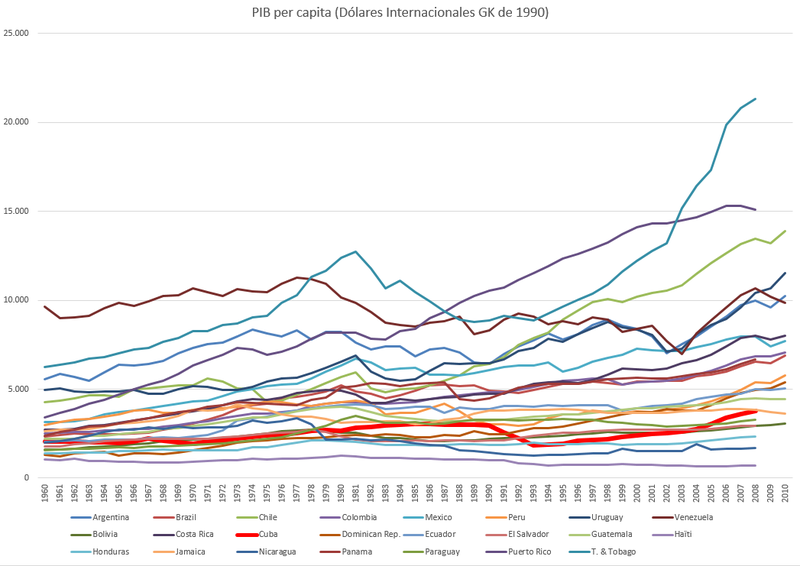 Let’s look at Cuban GDP per capita according to the World Bank. 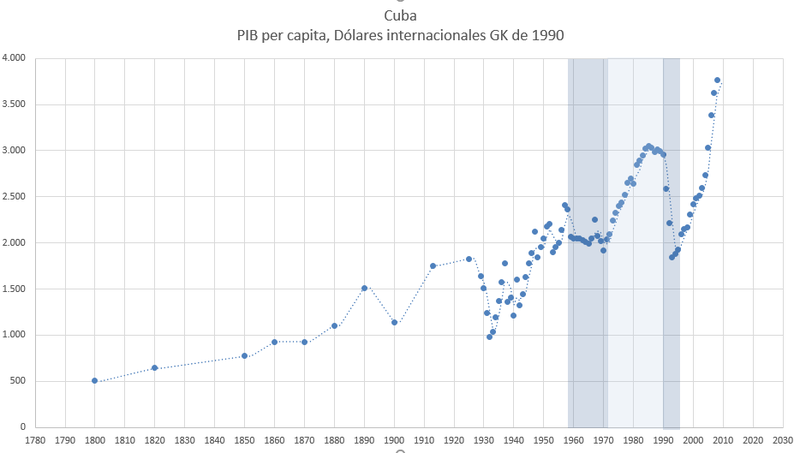 According to this measure, Cuba would have a GDP per capita in 2000 constant dollars of about 5400$. This places Cuba into the ‘middle class’ of Southamerica: below rich countries (Puerto Rico, Aruba, and Las Bahamas have 4x GDPpc), but above countries like Haiti, Bolivia, Nicaragua, Paraguay, Guatemala, Jamaica, or Colombia. In order to be able to compare datapoints within a given timeseries for a given country, constant dollars GDP takes inflation into account. Now, to compare different countries, their GDP expressed in their national currencies is converted to a common currency: dollars. This, however, doesn’t take into account the fact that prices in each country are different. That’s why another correction is applied: adjusting for Purchasing Power Parity (PPP). 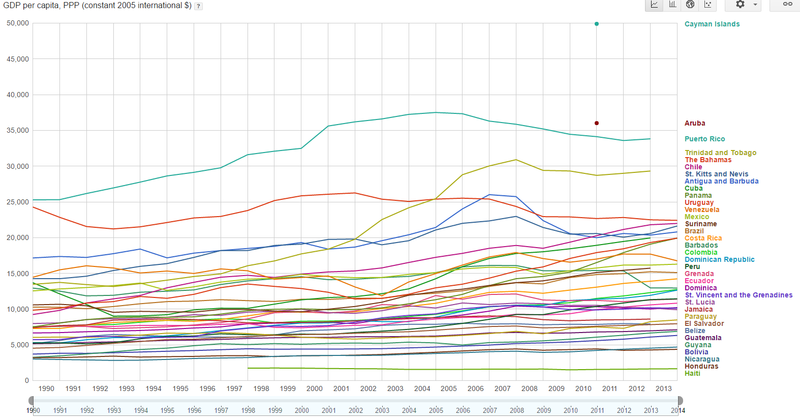 World Bank also has PPP adjusted GDP per capita data. 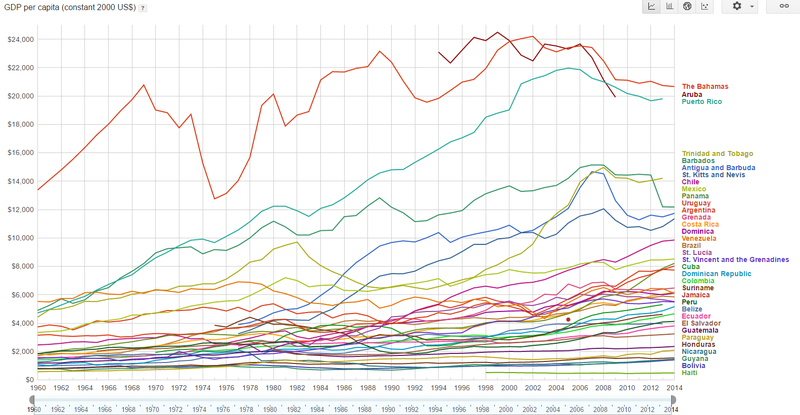 According to this series of data, Cuba is now above many more countries, only bested by the Cayman Islands, Aruba, Trinidad y Tobago, Las Bahamas, Chile, St. Kitts y Nevis, and Antigua y Barbuda. Cuba would be the 9th richest country out of 37, something much more impressive. 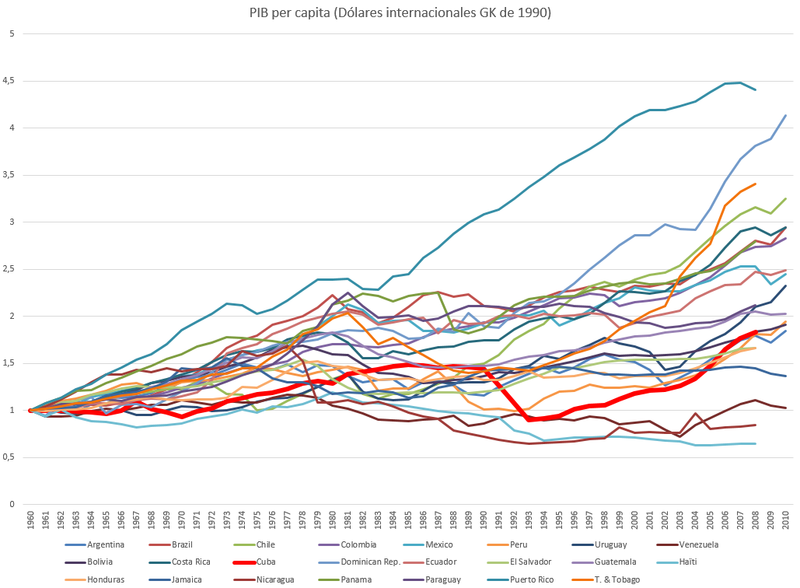 The paradox arises when one reads the Maddison Project GDP data, that tries to produce historically comparable GDP series for many different countries. Instead of PPP adjusted constant dollars, they use international (Geary-Khamis) constant dollars (1990), which is also PPP adjusted, but in a different way. By this measure, Cuba is again a poor country within Latin America, both in an absolute and relative sense, compared to 1960. The first period (first blue rectangle) starts after the end of the Cuban Revolution, marked by stagnation in economic growth. The second period starts with Cuba joining the Council for Mutual Economic Assistance (COMECON), an international cooperation organisation promoted by the USSR. Cuba received substantial subsidies from COMECON, including sugar purchases – Cuba’s top export – at prices 11 times market prices. With Soviet help, Cuba experiences strong rates of growth. The third period is the so called Special Period that started with the end of Soviet subsidies, which implied a need to readapt the economy. At the same time, the government implemented reforms that opened somewhat the economy to the outside, supporting tourism. These measures have some success, relaunching Cuba’s economy. So we now pose and solve our question: What is actually Cuba’s GDP’ Why do the World Bank and Maddison give different estimates? According to Bolt & van Zanden (2013), in the methodological notes of Maddison’s data, there are difficulties estimating what PPP index to apply to Cuba. They explain how they tried to overcome them. This is our first lead: that the issue lies in estimating PPP indices. In turn, in another paper, Ward and Devereux (2009) apply a different method, the Ideal Fisher Index . The Penn World Tables (the PWT) and Maddison (2007) value income with world prices calculated using the Geary Khamis procedure. In simple terms, Geary Khamis world prices are the expenditure-weighted average of national prices for all economies. We lack sufficient data to calculate Geary Khamis price indices for Cuba. For our bilateral comparison, the Fisher Ideal index has theoretical advantages over the Geary Khamis index. In particular, it is a “superlative index” and does not suffer from a substitution bias arising from using a fixed set of world prices see Diewert (1976), see also Neary (2004). These two methods (Geary-Khamis dollars and the IFI) so far coincide in their results. But then what does the World Bank do? The same thing that the Penn World Tables (PWT, another source for macroeconomic data) used to do: Use the price indices from the Interntional Comparison (price) Program from the World Bank. And it turns out that some authors who participated in the production of the PWT have criticised the 2005 version of the price indices, which is why Cuban GDP is not in the PWT anymore. The official GDP of Cuba for reference year 2011 is 68,990.15 million in national currency. However, this number and its breakdown into main aggregates are not shown in the tables because of methodological comparability issues. Therefore, Cuba’s results are provided only for the PPP and price level index. In addition, Cuba’s figures are not included in the Latin America and world totals. If the economistS in charge of PWT, and the ones at WB doubt their own estimates for PPP adjusted Cuban GDP, it is hard to take them as valid. Maddison’s and Ward-Devereux’s, on the other hand, do give similar results, which may indicate that they are closer to the truth. Yet another source that we can use is UNDP, the UN agency that produces the Human Development Indices. In a 2010 report, they also express doubts regarding the calculation of Cuban GDP. But in their 2015 report, using a revised GDP, they do provide an estimate, and this times it is closer to the values of Maddison and W-D. Using this corrected GDP, by the way, their HDI falls to 0.759, and so Cuba drops from the second country with the highest HDI in Latin America to being the ninth. The 2013 HDI value published in the 2014 Human Development Report was based on miscalculated GNI per capita in 2011 PPP dollars, as published in the World Bank (2014). A more realistic value, based on the model developed by HDRO and verified and accepted by Cuba’s National Statistics Office, is $7,222. The corresponding 2013 HDI value is 0.759 and the rank is 69th. Out of 30 countries, Cuba is the 25th, with Guatemala, Guayana, Nicaragua, Honduras y Haiti behind. Out of 12 Caribbean islands, Cuba is the 11th, with only Haiti behind. On the one hand, we have World Bank’s estimate, that WB itself doubts. On the other hand, we have estimates from Ward-Devereux, Maddison, and UNCP. These three sources seem to approximately coincide on what the actual Cuba GDP is. This triple coincidence, versus the questionable values from WB, would make us choose the former values, and so accept that Cuba is a poor country within Latin America. One critique to this would be to compare Cuba using other indicators: mortality, life expectancy, literacy rate, or malnutrition. This is also interesting, but not the point of this post. The paradox of Cuban GDP is thus solved. Good piece, but I think Latin America is the term you are looking for.